Electric Sliding Cottage Gate Installed. To be painted white. The emphasis for the past two months has been on getting the cottage completed so that the office can function again from a fixed base. 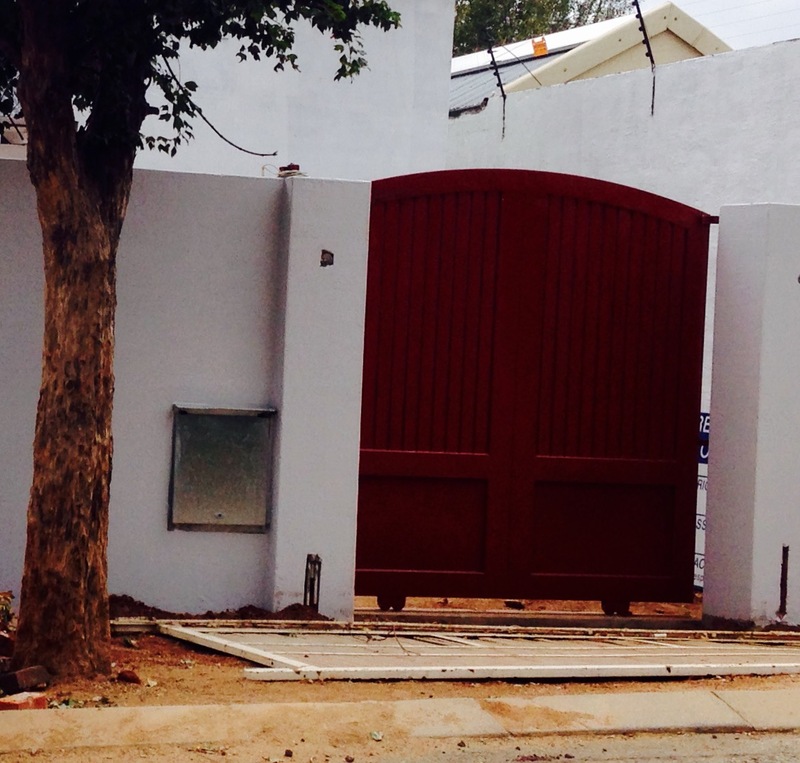 The ‘box’ fitted into the wall to the right of the gate (for those of you overseas), is the electricity meter board for the entire property. Meter Readers, who carry keys to these boxes, are supposed to do regular readings. When it came to the wooden flooring, I have to admit to having been an absolute sucker for marketing. 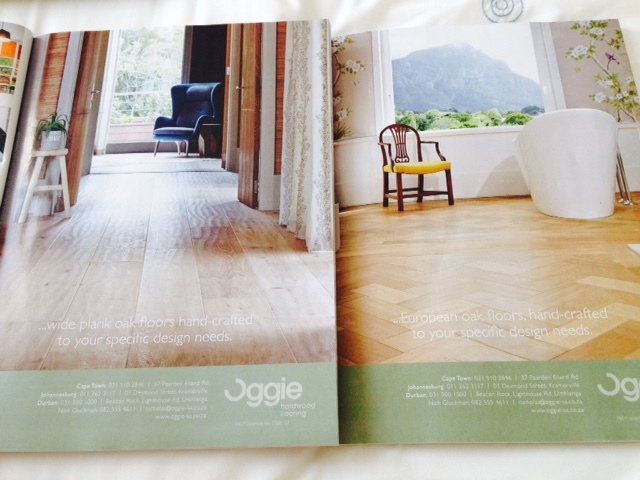 I have loved all the Oggie flooring print advertisements since I first became aware of them. I don’t know if I’ve ever seen a room photographed for one of their adverts that I haven’t wanted to move into. A visit to their showroom, right back in the beginning when we first started this project, confirmed for me that Oggie floors were the way to go. And so far, I’ve not been disappointed. The installers worked beautifully and the floors look great. 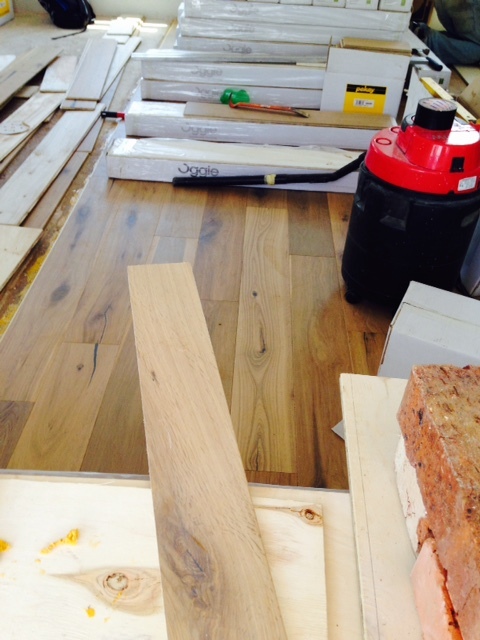 We chose oak planks in grey mist finish. Cottage Second Bedroom, South Facing Window. Above is an inside view of the re-positioned window in the second bedroom of the cottage. 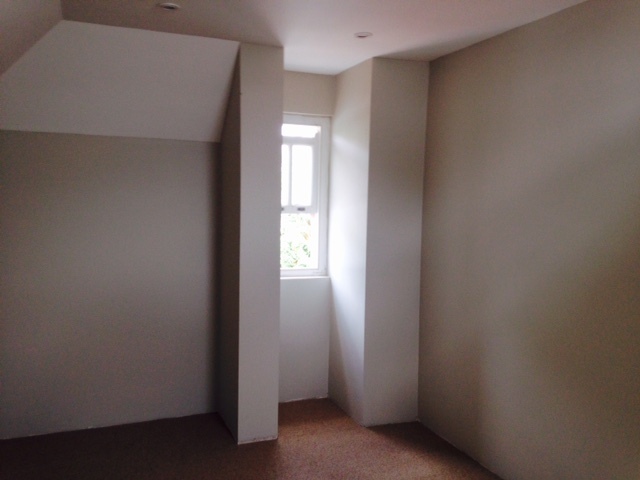 The carpeting has also been laid in the two bedrooms and since this photo was taken, the skirting boards have been installed. 2nd skylight on the left installed and small west facing window. The west facing wall of the cottage looked a little ‘blank’ to begin with, especially from the outside, so we decided, quite late, to add a small west-facing window which you can see in the photo above. You can also see the two skylights; one west facing and one north facing. 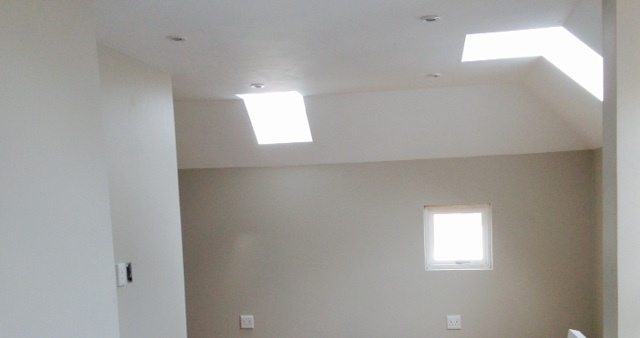 We have used Velux skylights throughout the cottage, guest suite and house. We had one in our previous home which we loved and we’re very familiar with them in England. They all open and they don’t leak. All the skylights have blinds. We’ve gone with manually operated blinds as they’re simpler and perhaps there is less to go wrong…. 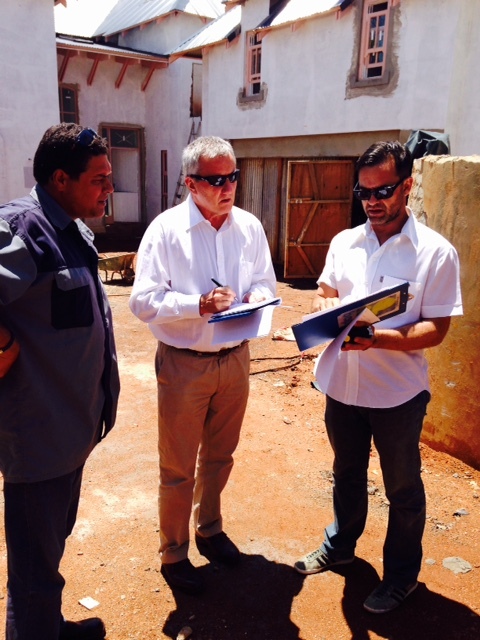 We’ve had expert service from Wolfgang Hinze who has the sole agency for Velux in Johannesburg. 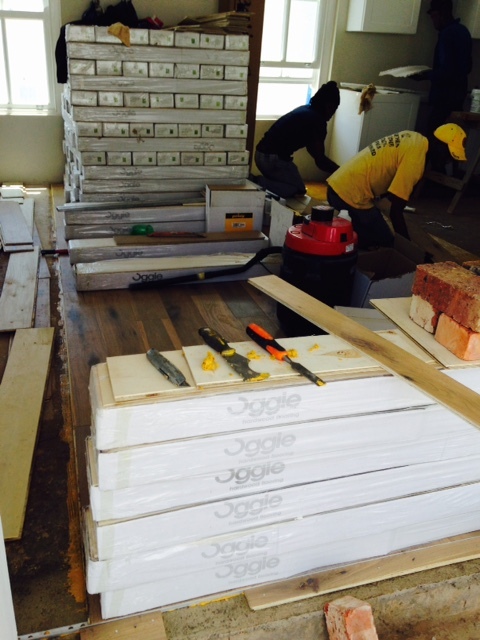 Tiling underway in the upstairs cottage bathroom. The cottage has a very compact downstairs guest bathroom (a toilet and basin – sink for the Americans…) and a small bathroom upstairs comprising a basin, toilet and a shower over a bathtub. We’re using the same white subway tiles in all the bathrooms on the property. 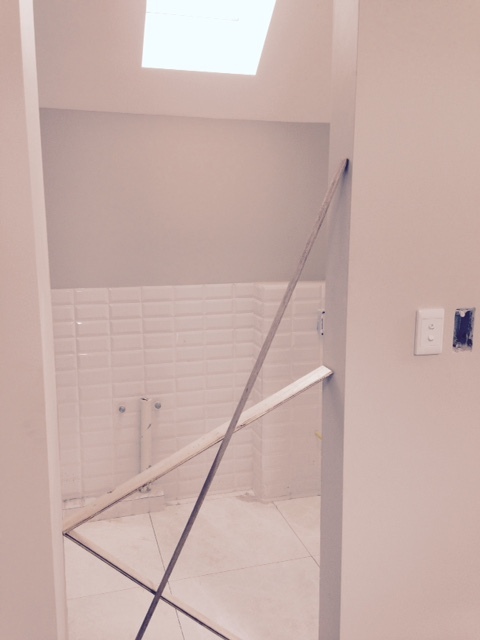 This little bathroom needs a sliding door and we’re having a some trouble extracting this from the door company. They have supplied the door but seem to have stalled over the sliding mechanism. 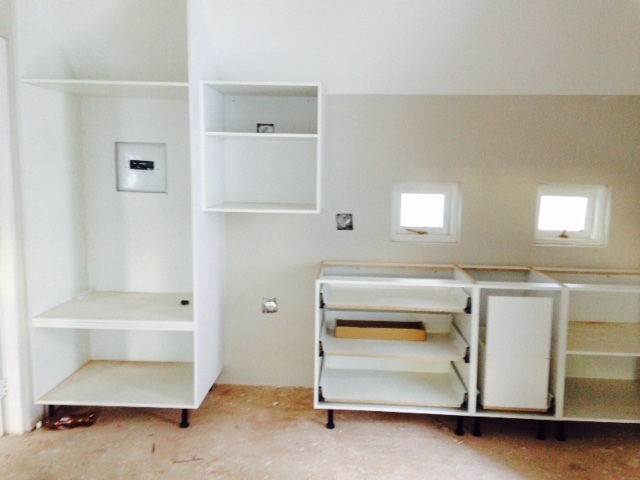 The start of the kitchenette cupboards in the guest suite. As soon as the cottage is finished and ready for occupation, we’re moving the pressure onto to the guest suite. 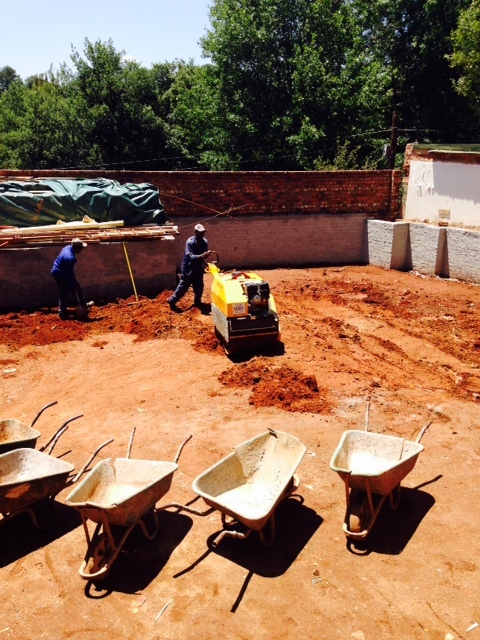 Once that is complete, we might have a place to stay when travelling back to Johannesburg for site meetings etc. The photographs do not show the sloping ceilings very clearly but you can work out where the slope begins from where the white paint starts. 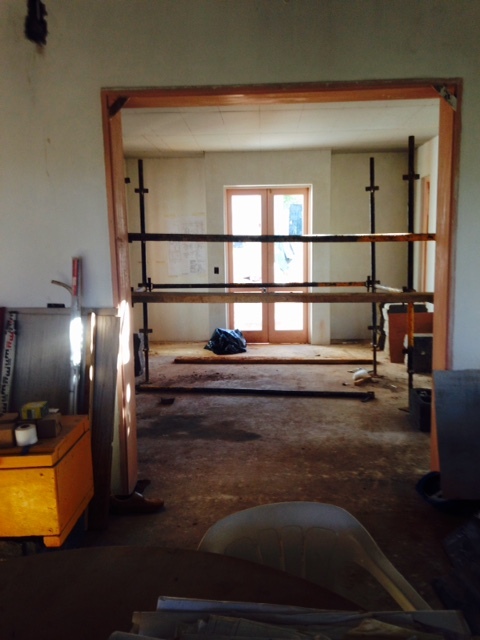 The small windows above the counter echo those in the main house kitchen. The boundary wall down the east side is very close to the windows. Close enough to have wall-mounted pots for herbs growing just outside. At the very least, I will have some sort of garden decoration mounted on the wall beyond the windows. Taken from living room, looking south through the library. It was good to be able, finally, to get a sense of this space, looking from the living room, south through the library. For over a year, this double door space has been boarded up and the library space has been used as a site office. Eventually there will be sliding doors in this space. Again, while all the doors in the main house have been delivered and installed, we are still waiting for these. Sliding doors seem to equal delays for some unknown reason. 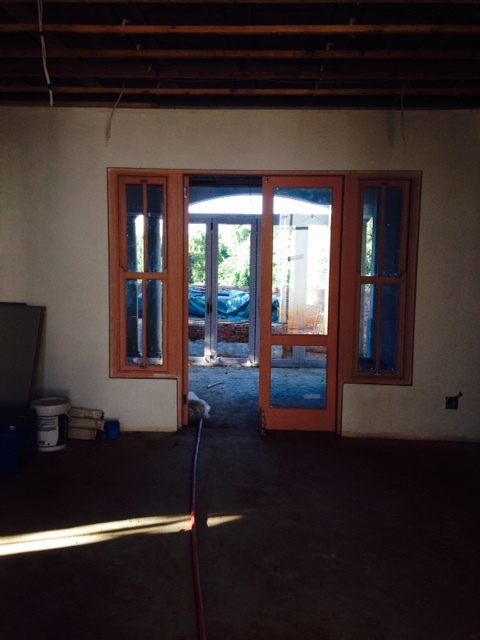 Taken from library sliding door opening, looking north, through living area and patio to garden. 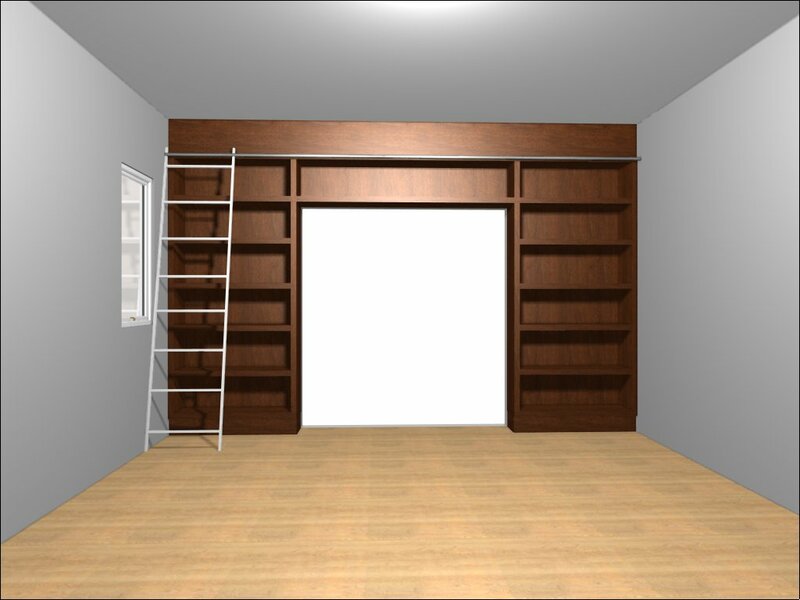 Shelves (white) will surround the sliding doors between the library and living room areas. 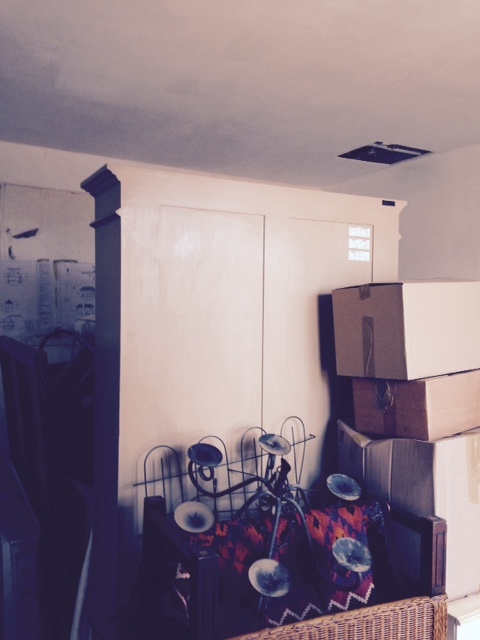 The sliding doors (when they arrive) will slide behind the shelving; ie between the back of the shelving and the wall. Compacting the front (north) garden. The level of the front garden has been raised considerably but there is still quite a way to go. I am reasonably satisfied that I will not hit broken bricks and other rubble each time I try to plant something, having been very specific about this from the start. I’ve watched this process carefully over the past few weeks and they seem to be doing a very thorough job. The pool company is supposed to move on site in about a week, so finishing this is important. The Patio Stacking Doors in place. Most of the time, I expect these doors to be open and because veranda space is important to me, I thought carefully about having them at all. But with downsizing to a house with effectively one open-plan living room, being able to use the outside veranda space in all weather is very useful. 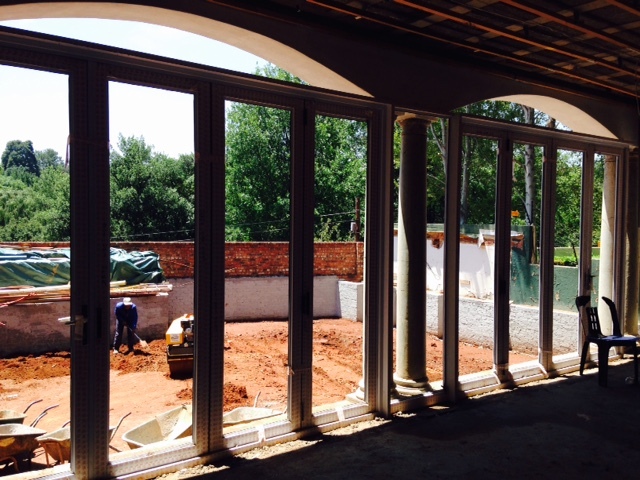 There will be fixed glass panes in the curved spaces above the doors. 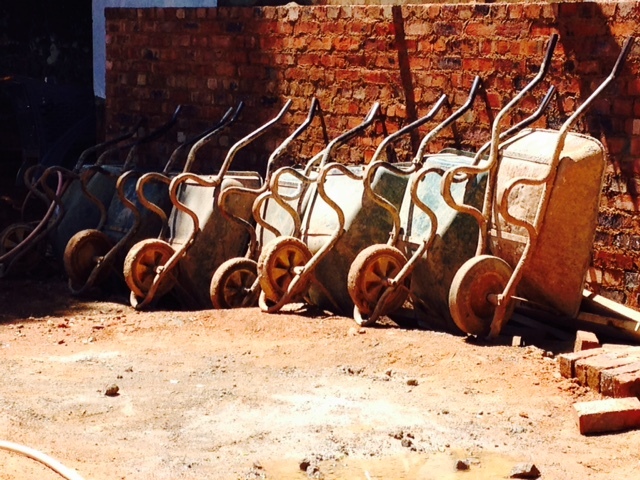 And someone, somewhere in the chaos of this building site seems to have a sense of style!